Real Madrid finally took the lead against Celta Vigo in the 61st minute of their La Liga clash, Madrid have rattled the crossbar and had two goals disallowed by VAR. Madrid scored a well-worked team goal to take the lead – about as perfect a first goal as Zinedine Zidane could have asked for as he takes charge of his first game since returning to Madrid. 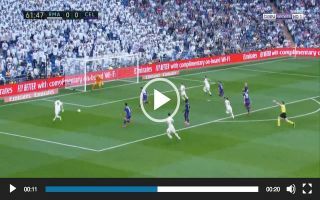 Luka Modric won the ball in Celta’s half before laying the ball off to attacker Marco Asensio, the 23-year-old brilliantly carried the ball forward before playing out wide to Karim Benzema – the Frenchman then teed up Isco with a low cross and the Spaniard tapped the ball into the back of the net. Madrid have finally broken the deadlock and in lovely style, this was a great team move.